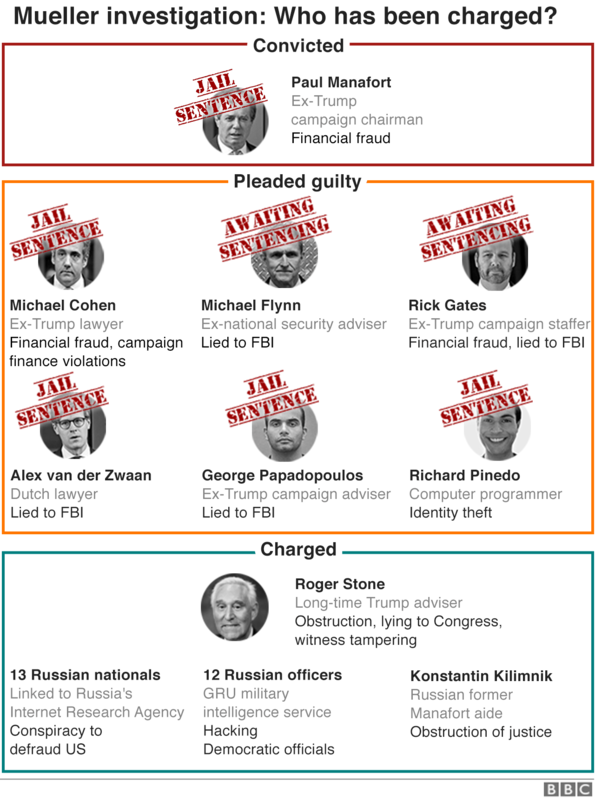 US President Donald Trump’s campaign did not conspire with Russia during the 2016 election, a summary of Special Counsel Robert Mueller’s report says. The allegation clouded the first two years of Mr Trump’s presidency and his allies see the report’s finding as a boost to his re-election chances. But Attorney General William Barr’s summary is inconclusive as to whether Mr Trump obstructed justice. Opposition Democrats are demanding full access to Mr Mueller’s report. Having repeatedly described the inquiry as a witch hunt, Mr Trump said it was an “illegal takedown that failed”. Despite the inconclusiveness of the report regarding allegations he obstructed justice, the president said it constituted “complete and total exoneration”. The report was the culmination of two years of investigation by Mr Mueller which saw some of the president’s closest former aides prosecuted and, in some cases, imprisoned, although not on charges related to the alleged Russian collusion. What does the summary say? “The special counsel did not find that any US person or Trump campaign official conspired or knowingly co-ordinated with Russia,” Mr Barr writes. In his summary, Mr Barr said the report “ultimately determined not to make a traditional prosecutorial judgment”. There was, he adds, insufficient evidence “to establish that the president committed an obstruction-of-justice offence”. Mr Barr ends his letter by saying further extracts from the report will be released but notes that some of the material is subject to justice department restrictions. How have Trump’s allies responded? Republican Senator Lindsey Graham, who has been sharply critical of the president in the past, tweeted that it was a “great day for President Trump and his team”. “The cloud hanging over President Trump has been removed by this report,” he said. “Great job by Mr. Mueller and his team to thoroughly examine all things Russia,” he added. Mr Trump’s lawyer, Rudy Giuliani, said the report had been better than he had expected while Republican Senator Mitt Romney welcomed the “good news”, tweeting that it was now “time for the country to move forward”. What are the Democrats saying? Democratic House Speaker Nancy Pelosi and Senate Democratic Leader Chuck Schumer said in a joint statement that Mr Barr’s letter “raises as many questions as it answers” and called for access to the full report. “For the president to say he is completely exonerated directly contradicts the words of Mr Mueller and is not to be taken with any degree of credibility,” the statement said. Congressman Jerry Nadler, the Democratic Chair of the House of Representatives Judiciary Committee, emphasised that Mr Trump had not been cleared of obstructing justice. Democratic Senator Richard Blumenthal, a member of the Senate’s Judiciary Committee, said that while there was a lack of evidence to support “a prosecutable criminal conspiracy”, questions remained over whether Mr Trump had been compromised. The American people deserve the Mueller report, not just the Barr report. Indeed, this set of summary conclusions hardly constitutes a report. What are they saying in Russia? Russia has denied being involved in hacking to influence the 2016 US election result. 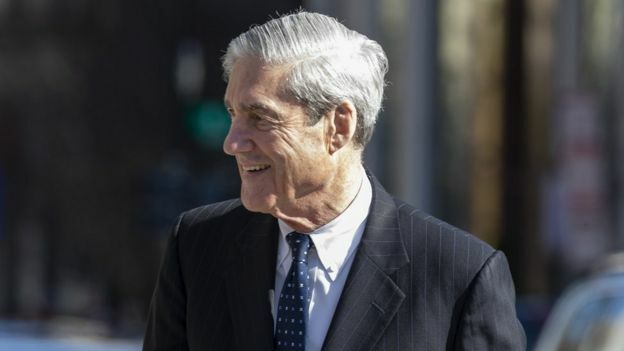 The release of the report’s key findings on Sunday could mark the start of a lengthy battle to see the entire Mueller report made public. Whenever further details are handed to Congress, Democrats may mount legal challenges if it is anything less than the entire report. Jerry Nadler said he would ask Mr Barr to testify in front of the House Judiciary Committee “in the near future” over “very concerning discrepancies and final decision making at the Justice Department”. About a dozen other investigations are continuing into Mr Trump’s activities. These include a federal inquiry in New York into possible election law violations by the Trump campaign and his businesses, and possible misconduct by the Trump inaugural committee. Congress is also continuing its own inquiries, mostly in the Democratic-controlled House of Representatives. Attorney General Barr summarises, mostly in his own words, the conclusions of the special counsel’s investigation. In one key line, however, he directly quotes the report. There, in Robert Mueller’s own words, is the end result of nearly two years of work, 2,800 subpoenas, hundreds of search warrants and countless hours of interviews. There were “multiple offers” of help from “Russian-affiliated individuals” to the Trump campaign, but they never took the bait. There was, as Donald Trump might say, “no collusion”. At least, no evidence of it was unearthed. The obstruction of justice component is a murkier matter. The decision of whether to charge Mr Trump with interference with the various investigations wasn’t Mr Mueller’s. Saying it involved “difficult issues”, the former FBI director punted. Instead, Mr Barr – in consultation with Department of Justice staff – decided not to prosecute, in part because there was no apparent underlying crime to obstruct. Make no mistake, today was a very good day for Mr Trump. While a bevy of inquiries into his presidency will grind on, the shadow of Mr Mueller’s investigation – hovering over the White House since May 2017 – has been lifted.